On the reverse side of some dart boards is a game called baseball darts. The dart board is divided into sections which detail everything from strikes and balls to hits, outs and even some tactical plays such as stolen bases. Players need just a cursory knowledge of how baseball works in order to "play ball" on the dart board. The dart game lasts "nine innings," just as a standard baseball game would. Divide into two even teams. There is a home-run circle found on the baseball dart board that can be used to divide players. Each player aims for that circle; the players who miss to the left can be on one team, while players who miss to the right can be on the other. If a player throws it in the home-run circle, he can choose his team. Set a batting order amongst the team. While you do not need nine players on each team, the game of baseball darts utilizes a "batting order," just like a real baseball game. Determine the home and visiting team. Just like in a real baseball game, the visiting team will bat in the top half of the inning and the home team in the bottom half of the inning. You can flip a coin or throw a dart to see who is closest to the home run circle to determine the home team. Learn how runs are scored. The team throwing the darts will always be on offense in this game. The team's objective is to get runners on base by throwing darts in the "hit sections." The hit sections consist of the center of the dart board, as well as the single, double, triple and home-run circles. If a dart lands in one of these sections, the runner gets on base accordingly. Note that runners must be forced to move. This means if a runner is on second and your team hits a single, the runner can only move to third base, and not score as they would in most live baseball situations. Learn about how outs are scored. Around the places where a player gets a hit are sections that detail strikes and outs. 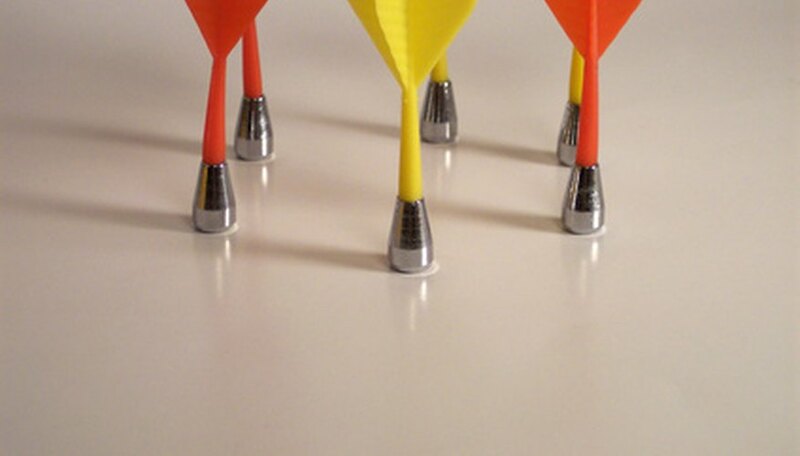 The baseball dart game operates in the same manner as a live baseball game. Three strikes equal an out, and three outs equal a half-inning. Understand the specialty zones. There are several sections on the baseball dart board which involve specialty plays. These sections are sacrifice, stolen base and double play. If the dart lands in the sacrifice and a runner is on base, an out is recorded and the runner advances one base. If there is no one on base, it is an out. If the dart lands on a stolen base, and there is a runner on base, the runners advance one base. If no one is on base, then nothing happens. If a dart lands in the double-play section, two outs are recorded. If there are already two outs in the inning, that inning is simply over. "Play ball!" Just like in live baseball, there is no limit to the number of "pitches" signified by darts for each member at the plate. Each member will continue to throw darts until they walk, get a hit or record an out. Scott Damon is a Web content specialist who has written for a multitude of websites dating back to 2007. Damon covers a variety of topics including personal finance, small business, sports, food and travel, among many others.